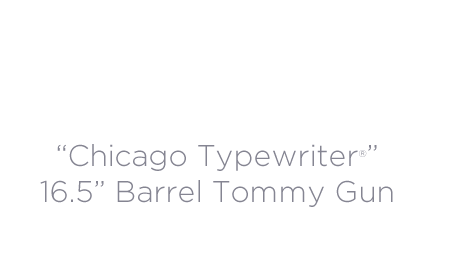 Thompson 1927-A1 Long Guns - Auto-Ordnance | Original manufacturer of the world famous "Tommy Gun"
For more than 100 years, the “Chicago Typewriter®”, the time-honored submachine gun, has been a favorite among collectors and shooting enthusiasts. The .45 ACP caliber Thompson 1927-A1 has a pinned Cutts compensator, which lengthens the finned barrel length to 18”, and puts the overall length for the carbine at 41” from buttstock to muzzle. 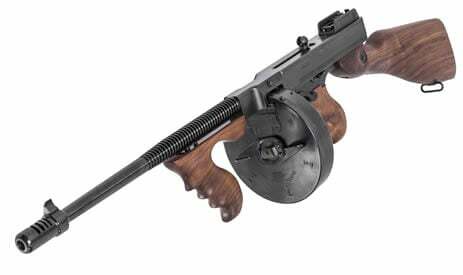 The Tommy Gun is available with a blued steel receiver (T1 models) or a lighter weight aluminum receiver (T5 models). They have a blade front and open rear adjustable sight. The fixed stock is crafted in luxurious polished American Walnut and has a vertical foregrip. 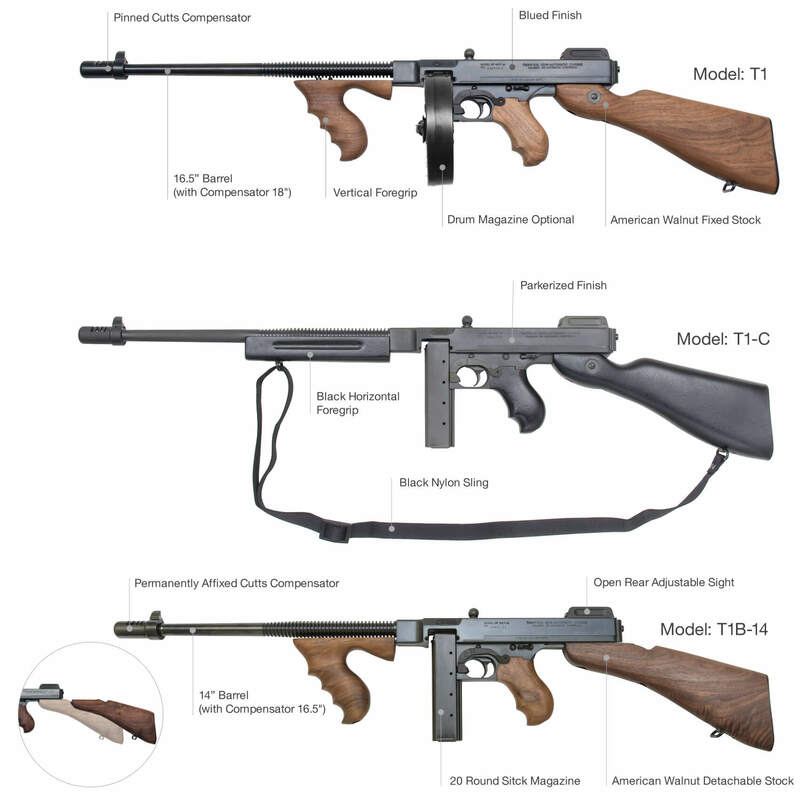 The Thompson T1-14 models with a barrel length of just 16.5”, it is 1.5” shorter than the existing T1 models with the 18” barrels. The BATFE recently approved the permanently affixed Cutts compensator as a part of the 16.5” barrel. 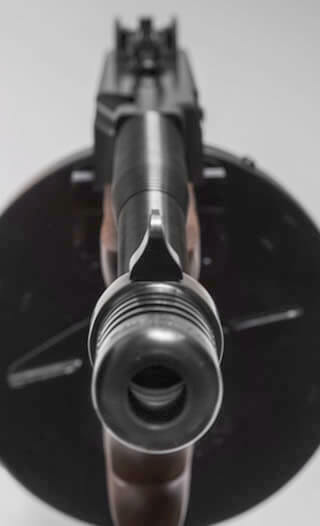 The pinned Cutts compensator offered on the 18” barrel models are not considered part of the barrel. The Thompson T1-C “Commando” model features parkerized steel and all wood stock, rear grip and horizontal foregrip in a durable black finish. It comes with a black nylon sling. 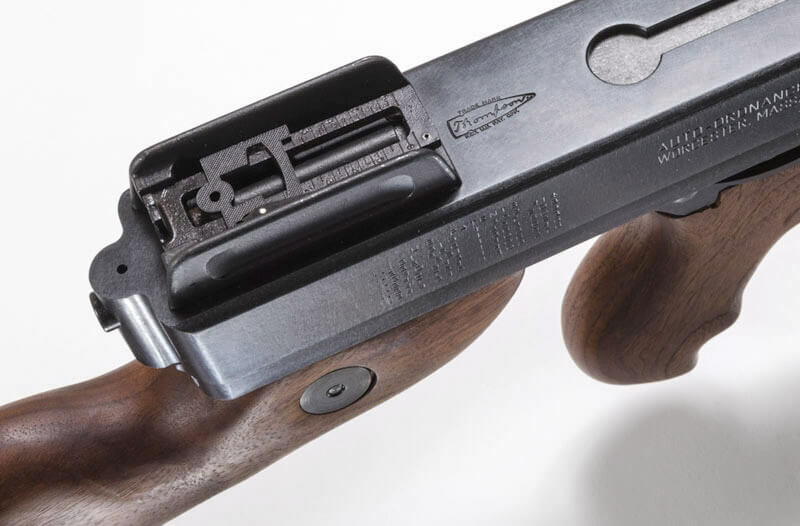 The Thompson T1B model comes with a detachable buttstock with vertical foregrip. The overall length is 41” but it becomes 31.5" when the buttstock is detached from the frame. The Tommy Guns ship with one 20 round stick magazine. Also available, the models with a drum magazine (100 round, 50 round, 10 round) or 10 round stick magazine.